Hasselblad has unveiled its latest addition to the medium format camera market – the Hasselblad H5D. Strictly for the high end, the H5D boasts a number of MP variants, including 40, 50 and 60 megapixel versions. The H5F has a number of new features added, including a new macro converter, improved weather protection, a True Focus II autofocus system and the ability to create print-ready JPGs straight from the camera. 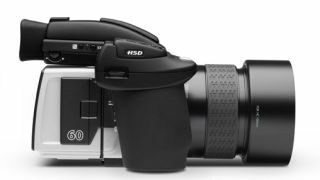 Speaking about the H5D, Peter Stig-Nielsen, Hasselblad's Director of Professional Camera Products said: "Customers will immediately notice the new-look and improved ergonomics and this progressive system also brings upgraded performance on a number of levels. "Hasselblad is a world-leader with an unmatched and comprehensive range of lenses. Now that line has been extended with the new wide angle HCD 4.8/24 mm lens, which offers the same performance as the HCD 28 mm and is the equivalent of a 17 mm on 35 mm DSLR format. "Additionally, our new Macro Converter provides excellent close-up performance with the HC 50, HCD 28 and HC 35 lenses - negating the need for additional macro lens purchase." The flagship Hasselblad H5D release date is December, with pricing to be announced. Considering the H4D is still tens of thousands of pounds, we would recommend you speak to your bank manager before thinking about purchasing one.